President Robert Mugabe is under heavy guard after soldiers have cordoned off the parliament building and the defence headquarters as the security situation deteriorates in the southern African country. Two journalists have reportedly been hospitalised after they were allegedly assaulted by the military while covering the unfolding events in the Zimbabwean capital. The recently renamed international airport has also been sealed off. No official comment has been issued by authorities thus far. The American embassy has also issued a warning to its citizens to stay indoors. In the wake of the military takeover in Zimbabwe, the national police force has recalled all officers on leave. A top police official who insisted on anonymity because he was not authorised to speak to the press told The Associated Press that all police on leave have been ordered to return to their posts immediately. Zimbabwe's army said Wednesday it has President Robert Mugabe and his wife in custody and is securing government offices and patrolling the capital's streets following a night of unrest that included a military takeover of the state broadcaster. The night's action triggered speculation of a coup, but the military's supporters praised it as a "bloodless correction." Armed soldiers in armoured personnel carriers stationed themselves at key points in Harare, while Zimbabweans formed long lines at banks in order to draw the limited cash available, a routine chore in the country's ongoing financial crisis. People looked at their phones to read about the army takeover and others went to work or to shops. In an address to the nation after taking control of the Zimbabwe Broadcasting Corporation, an army spokesman said early Wednesday the military is targeting "criminals" around Mugabe, and sought to reassure the country that order will be restored. We are only targeting criminals. It was not clear where Mugabe, 93, and his wife were on Wednesday but it seems they are in the custody of the military. Their security is guaranteed, the army spokesperson said. "We are only targeting criminals around Mugabe who are committing crimes that are causing social and economic suffering in the country in order to bring them to justice." The spokesman added "as soon as we have accomplished our mission, we expect that the situation will return to normalcy." The army spokesman called on churches to pray for the nation. He urged other security forces to "cooperate for the good of our country," warning that "any provocation will be met with an appropriate response." The military actions appear to put the army in control of the country. Army commander Constantino Chiwenga had threatened on Monday to "step in" to calm political tensions. Mugabe's ruling ZANU-PF party responded by accusing the general of "treasonable conduct." But now Chiwenga appears to be in control. The military will return Zimbabwe to "genuine democracy" and make the country a "modern model nation," said Chris Mutsvangwa, chairman of the war veterans' association, told The Associated Press in Johannesburg. Emmerson Mnangagwa, the vice-president fired by Mugabe, is back in the country. He flew into Manyame airbase this morning. He’s always had a lot of support in the army and it’s very likely he’ll be taking over as the de facto head of government, with Mugabe, 93, as a figurehead. It is fairly clear the armed forces have taken power,they control the state broadcaster, the streets of the capital and, most importantly, the personal residence of the head of state. It is also fairly clear why they have acted now. 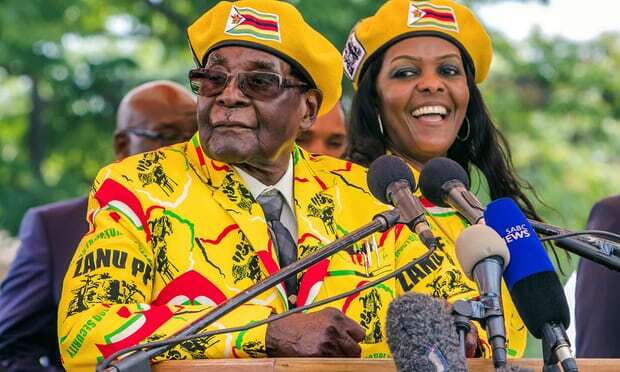 This is a pre-emptive strike to stop Grace Mugabe, the president’s 53-year-old wife, and her clique taking pole position in the race to succeed the oldest living ruler in the world. The fortunes of the first lady have been rising in recent months, at the expense of the allies of the military within the ruling Zanu-PF party. The most obvious example is Emmerson Mnangagwa, the vice-president and veteran of Zimbabwe’s liberation war who was fired unceremoniously last week, clearing the way for Grace to be appointed in his place. But there are others who have been sidelined. Senior soldiers fear they will suffer if Grace and her associates take over. They also believe she will be corrupt, vindictive and incompetent, and know that the first lady’s violent outbursts and extravagance – as well as that of her entourage and sons – have already made her very unpopular. The soldiers are also concerned about a further massive deterioration of the economy. Inflation and the collapse of the Zimbabwean currency has already impoverished many rank and file soldiers, and hit the incomes of officers too. The wages of the millions of government employees – troops, police, civil servants and others – often go unpaid for months on end. This means the seizure of power today will be greeted by many with relief, if not enthusiasm. The course of events over the next few days is harder to see clearly. Whatever happens is likely to be chaotic and fast-moving – though it will be a surprise if there is any violent resistance to the takeover. Once the dust settles, and the rise of Grace and her faction has been reversed, the soldiers will have to decide. Will they return power to the civilians – particularly the ageing head of state and commander-in-chief, Mugabe – or will the temptation to run the country themselves prove too great? Will they call back Mnangagwa to take power himself with Mugabe perhaps reduced to a figurehead? Two key markers will be the annual convention of the Zanu-PF next month, and the elections next year. Observers will be looking for an early commitment from the military to allowing both to go ahead. The opposition MDC party has said it wants to see a peaceful, constitutional democratisation of Zimbabwe following the army move, Reuters reports. In a statement, the MDC says it urges the establishment of a stable, democratic and progressive nation state. Chris Mutsvangwa, chairman of the Zimbabwe war veterans’ group, has praised the night’s events as a bloodless correction of gross abuse of power by members of Robert Mugabe’s government. The war veterans are supporters of Emmerson Mnangagwa, the former vice-president who was fired Mugabe last week following a power struggle over succession with the president’s wife, Grace Mugabe. Emmerson Mnangagwa, dismissed as vice-president last week in a move that was widely interpreted as clearing the way for the promotion of Grace Mugabe, is reported to have returned to Zimbabwe. Zimbabwean defence forces have seized control of the state broadcaster ZBC overnight, screening a statement declaring that it is “targeting criminals” around the president, Robert Mugabe. Mugabe and his family are “safe and sound”, said the army spokesman Maj Gen SB Moyo said. Mugabe has not appeared in public or issued a statement. It is unclear whether he is in military custody. Armoured vehicles and troops have on Wednesday morning blocked roads in central Harare around government buildings and the presidential residence. There are reports that at least one minister, Ignatius Chombo, who holds the finance brief, has been detained by the military. Chombo is a leading member of the G40 faction of the ruling Zanu-PF party, led by Mugabe’s wife, Grace, who is vying to succeed the 93-year-old president. This faction is believed to be the target of the military’s action. The national police force has recalled all officers on leave. A senior police official, who insisted on anonymity because he was not authorised to speak to the press, said all officers have been ordered to return to their posts immediately.